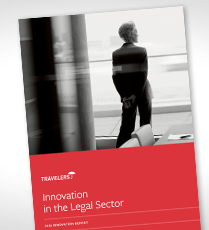 A reader sent word noting the publication of the 2016: “Legal Innovation and Risk Management Report” published by Traveler’s and The Lawyer. "It’s worth reflecting on why innovation is important. The first driver is external. Clients are increasingly demanding more competitive fees, greater choice when it comes to fee arrangements and of course a great service. Innovating, whether that be investing in technology, offering alternative fee arrangements or flexible working, can help address these client demands." "The third driver is regulatory. Increased awareness of certain risks, including cyber-attacks, may result in increased attention by regulators. A certain amount of innovation, for example regarding management structures and internal controls, is then required to ensure compliance." "Indeed 37% of surveyed UK law firms pinpointed ‘use of technology’ as their most innovative initiative in the last three years, more than double the number that stated any other area of innovation." "Why are firms investing in new technology? Survey participants mentioned a huge number of reasons from improving conflicts and client management to marketing and business development." "Use of technology to manage file opening and deal with risk management of a matter from the outset. The benefit is seen in the reduced level of notifications." "A new client inception programme (still being implemented). Benefit is a single end-to-end client take-on process which encompasses client due diligence, credit checking, billing regime, terms of business through to a letter of engagement." "Conflicts Management (Intapp) - modernised and centralised conflict clearance." "Use of cloud to enable remote working and collaborative work." "AI for legal process management. Uniform and efficient integration of knowledge into legal delivery processes, delivering fixed fee work with greater certainty across practice streams." "Clients are focussing far more on efficiency and innovation in their firms, independent of whether this drives costs down for them. They want to know their strategic partners are innovative and efficient and to learn from them to improve the position of the in-house team and organisation as a whole. This is perhaps unsurprising given the expanded, strategic role of the GC in clients."